We are schoolmates back in college at the Lyceum of the Philippines University under the College of Business Administration. In year 2004, we became classmates in one our subjects, particularly Taxation 1. One day, our professor was late in class which seldom happens. We actually don’t know if she will be attending the class or not. DARRELL: I want to go to a computer shop that time, so I gave her my number and asked if she can text me if our professor came to class after I left. TIMMY: So I texted her him after school. I told him that our professor did not come to our class that day. DARRELL: I’m not yet attracted to her at first. TIMMY: I’m with somebody else. TIMMY: I lost my phone. So we lost our communication from there as well. DARREL: although we usually see each other in school, I’m too shy to approach her to ask for her number again. DARRELL: I realized I’m interested to get to know her more and be with her more often. TIMMY: I realized I like him, but again, I’m still with somebody else. DARRELL: I committed myself to another girl. TIMMY: I finished college and worked as an accounting assistant at the SM Head Office under Casamia Furniture Center, Inc.
DARRELL: I also graduated from college and also worked at the SM Head Office under Marketing Convergence, Inc. Sometime in June 2008, our paths crossed again. During a lunch break at work, we bumped into each other at the canteen. From then on, we started texting each other again and would sometimes go out together. Afraid of losing each other for the third time, we took the risk of showing and expressing what we feel despite the fact that we might hurt other people. We didn’t know what our action will bring but we strongly fought for it. Yes, it’s difficult, but it’s all worth it. There is actually no marriage proposal that happened. One day, while we were strolling at the mall, we found each other talking about our dream wedding. From there, we started planning our own wedding day. Wedding planning is not as simple as we initially thought. 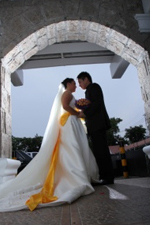 At first, we planned the big day to be on June 18, 2010 but decided to postpone it, in consideration of our budget and our parents’ advice. 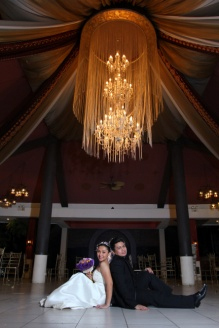 Finally, with the blessing of our parents, we set our wedding date to June 25, 2011. Everything was set. Even the smallest wedding detail was noted, …then we woke up on our wedding day with Typhoon Falcon threatening to ruin our special day. To say we’re disappointed is an understatement, we planned this day for about a year and Typhoon Falcon is about to ruin it. Due to the very bad weather, we’re not even expecting anymore that our 350 confirmed guests will be able to witness our big day. But at around 1:00pm, good news started to pour. The sky started to clear, it’s like telling us that everything will be ok.
One of our principal sponsors brought a white Nissan car which we can use as our bridal car. Then the supplier of the supposed bridal car arrived through a pick-up truck to bring the flowers for the car and return our downpayment. And the most important of them all, when we arrived at the church, it was filled with hundreds of our dear friends and relatives, including our bridesmaid who bravely crossed the flood just to be with us on our wedding day. Our big day turned out to be not just big but also long for us. There’s no perfect wedding after all. And it also made us realized that everything is not about what we planned but what God wants and plans for us. In the end, what really matters is that we ended up together, and not even a typhoon can stop our union. If it’s meant to be, it will definitely be.